The headquarters of Lehman Brothers in Times Square in 2008, the year the financial services firm filed for bankruptcy. The 2008 banking crisis underscored how vulnerable the financial sector had become. Huge institutions like Countrywide were saddled with mountains of bad mortgage and consumer debt. And the losses were magnified by the widespread use of leverage and derivatives such as credit default swaps. Today, says Wayne Abernathy of the American Bankers Association, banks are much healthier and safer. "The banking industry is so strong today, I don't see any of those risks causing systemic trauma to the economy as we had in the past," he says. Abernathy says big banks now undergo tough stress tests to make sure they can withstand severe downturns, and they routinely pass the tests. He says banks are also much better capitalized than they were before the recession. Even if large banks do get in trouble, Abernathy says, rules are now in place to manage their orderly liquidation. Sheila Bair, the former head of the Federal Deposit Insurance Corp., agrees that on balance, banks are probably safer than they were before Lehman. For one thing, she says, the Dodd-Frank financial reform bill put in place a mechanism to unravel big banks without government bailouts. "Would it be easy? No. Would it be messy? Yes. But it could be done in a way that I do believe would insulate the broader economy from any problems from a large bank failure and impose the losses where they belong — on the shareholders and creditors of that large financial institution, not on taxpayers or other members of the industry," Bair says. And yet Bair sees Dodd-Frank as a big missed opportunity. Congress left it up to regulators to flesh out the bill's provisions, and the process has become bogged down in a kind of lobbyist feeding frenzy. In an appearance on CNBC this summer, Treasury Secretary Jacob Lew seemed to acknowledge how long reform has taken. "If we get to the end of this year and we cannot, with an honest straight face, say we've ended [the concept that giant financial firms are too big to fail], we're going to have to look at other options," Lew said. As this process has dragged on, key reform opportunities have been missed, Bair says. She says there's still too much speculative use of the risky financial instruments such as credit default swaps. Banks still rely too much on short-term debt. And as the London Whale trading fiasco at JPMorgan Chase showed, commercial banks still invest in complex financial instruments using federally insured deposits. "So I would have to really kind of give reform a mediocre grade. That's not to say nothing has been done. There have been some significant changes, but not nearly what we need," Bair says. "We need transformative changes, not just working it around the edges, and it seems like we've been working it around the edges." Anat Admati, professor at Stanford's business school, goes further. In her book, The Bankers New Clothes: What's Wrong With Banking and What to Do About It, Admati argues that bank capital requirements need to be increased even more than they have been. She says when banks take in deposits from customers, they're essentially borrowing money, and they can turn around and invest almost all of it. She says it's a crazy business model. "Look, I come from Silicon Valley, and the banks are not unique in taking risks. What's unique is that they take it with so much borrowed money. That's why they're so fragile," Admati says. Admati says Dodd-Frank may have created a new mechanism to liquidate banks, but if enough big banks fail, the government will still need to bail them out. "There is no way that these large institutions will go through bankruptcy without affecting the economy. They are so interconnected and they are so global, there will be so many runs and frozen credit within the system, and derivative contracts unraveling and all kinds of things, that the economy will be harmed," Admati says. But bank industry officials argue that what's hurting the economy is all the regulation taking place. Abernathy of the American Bankers Association says bankers already operate in a much more tightly controlled world than they used to. Not only are global capital requirements higher, they're a lot more complex — with different kinds of assets weighted in confusing ways. He also says U.S. regulators exercise much more control over whether banks can issue a mortgage or business loan than they used to. "A lot of the new rules that have gone into effect over the past five years take away much of the judgment bankers were allowed to exercise in the past. [It's] much tougher to exercise that judgment now," Abernathy says. But he says the worst thing about the new environment for bankers is how uncertain it is. Many of the new regulations haven't been written. Others are so new it's not yet clear what impact they'll have. Five years after Lehman collapsed, regulators are still trying to decide what shape the banking world should take, and how to protect the economy from the ravages of another meltdown. A handful of dates in history stand out as moments people realized the world was changing. One of those dates came five years ago, when Lehman Brothers collapsed. In retrospect, we know the economy was already in recession, and things were getting worse. At the time, people were not sure how bad the looming financial crisis would get. 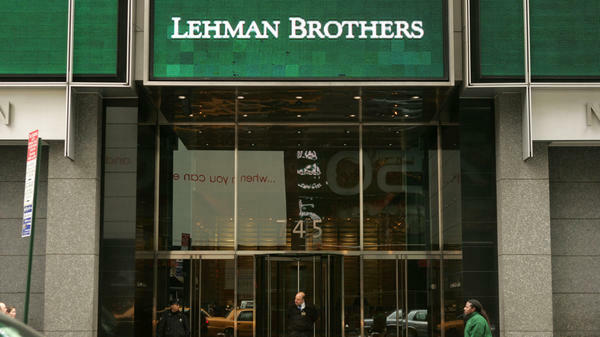 Lehman's collapse drove home reality. It caused stocks to fall worldwide, and forced a government bailout of the financial industry. Today's banking industry may be stronger, though efforts to reform bank regulations have drawn plenty of criticism. JIM ZARROLI, BYLINE: The 2008 banking crisis underscored how vulnerable the financial sector had become. Huge institutions such as Countrywide were saddled with mountains of bad mortgage and consumer debt. And the losses were magnified by the widespread use of leverage and derivatives, such as credit default swaps. Today, says Wayne Abernathy of the American Bankers Association, banks are much healthier and safer. WAYNE ABERNATHY: The banking industry is so strong today, I don't see any of those risks causing systemic trauma to the economy as we had in the past. ZARROLI: Abernathy says big banks now undergo tough stress tests to make sure they can withstand severe downturns and routinely pass them. He says banks are also much better capitalized than they were before the recession. And even if large banks do get in trouble, Abernathy says, rules are now in place to manage their orderly liquidation. Former FDIC head Sheila Bair agrees that, on balance, banks are probably safer than they were before Lehman. For one thing, she says, the Dodd-Frank financial reform bill put in place a mechanism to unravel big banks without government bailouts. SHEILA BAIR: Would it be easy? No. But it could be done in a way that I do believe would insulate the broader economy from any problems, from a large bank failure and impose the losses where they belong: on the shareholders and on creditors of that large financial institution, not on taxpayers or other members of the industry. ZARROLI: And yet Bair sees Dodd-Frank as a big missed opportunity. Congress left it up to regulators to flesh out the bill's provisions, and the process has become bogged down in a kind of lobbyist feeding frenzy. As this process has dragged on, key reform opportunities have been missed. She says there's still too much speculative use of the risky financial instruments called credit default swaps. Banks still rely too much on short-term debt. And as the London Whale trading fiasco at JPMorgan Chase showed, commercial banks still invest in complex financial instruments using federally insured deposits. BAIR: I would have to really kind of give reform a mediocre grade. That's not to say nothing has been done. There have been some significant changes, but not nearly what we need. We need transformative changes, not just working it around the edges. And it seems like we've been working it around the edges. ZARROLI: Anat Admati, professor at Stanford Business School, goes further. In her book, "The Bankers New Clothes: What's Wrong With Banking and What to Do About It," Admati argues that bank capital requirements need to be increased even more than they have been. Right now, she says banks take in deposits from customers, which means they're essentially borrowing money, and they can turn around and invest almost all of it. ANAT ADMATI: Look, I come from Silicon Valley, and the banks are not unique in taking risks. What's unique is that they take it with so much borrowed money. That's why they're so fragile. ZARROLI: Admati says Dodd-Frank may have created a new mechanism to liquidate banks, but if enough big banks fail, the government will still need to bail them out. ADMATI: There is no way that these large institutions will go through bankruptcy without affecting the economy. They're so interconnected and they are so global, there would be so many runs and frozen credit within the system and derivatives contracts unraveling and all kinds of things, that the economy will be harmed. ZARROLI: But bank industry officials argue that what's hurting the economy is all the regulation taking place. Wayne Abernathy of the ABA says bankers already operate in a much more tightly controlled world than they used to. Not only are global capital requirements higher, they're a lot more complex, with different kinds of assets weighted in confusing ways. He also says U.S. regulators exercise much more control over whether banks can issue mortgages or business loans than they used to. ABERNATHY: A lot of the new rules that have gone into effect over the past five years take away much of the judgment that bankers were allowed to exercise in the past. ZARROLI: But Abernathy says the worst thing about the new environment for bankers is how uncertain it is. Many of the new regulations haven't been written. Others are so new, it's not clear yet what impact they'll have. Five years after Lehman collapsed, regulators are still trying to decide what shape the banking world should take and how to protect the economy from the ravages of another meltdown. Jim Zarroli, NPR News, New York. Transcript provided by NPR, Copyright NPR.